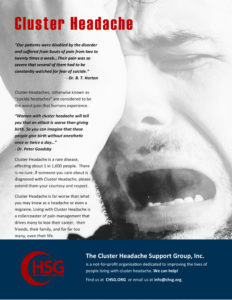 Cluster Headache is characterized by severe "stabbing" or "burning" pain located in or around one eye. The pain may spread across the temple and over the ear. It lasts 15 minutes to 3 hours and can recur many times per day for months or years. Patients are restless and agitated. They pace and rock about, moaning, screaming, and even cursing uncontrollably. Attacks of severe, strictly unilateral pain which is orbital, supraorbital, temporal or in any combination of these sites, lasting 2-30 minutes and occurring several or many times a day. The attacks are associated with ipsilateral conjunctival injection, lacrimation, nasal congestion, rhinorrhoea, forehead and facial sweating, miosis, ptosis and/or eyelid oedema. They respond absolutely to indomethacin.